This week one of my projects here at gloProfessional has been to re-vamp our Knowledge Manual for Lycon wax. It's been a fun project mostly because it's all new to me! As I put information together, I remembered that we were given a few samples along with product training, one of which was Tea-Tree Soothe. So as I put together its page in the knowledge manual, I dug around and found my sample. 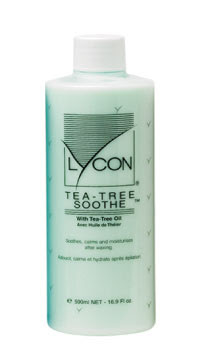 Tea-Tree Soothe's key ingredients are Tea-Tree oil, Rose oil and Chamomile extract which soothe moisturize and protect the skin. It has a very clean, fresh smell and absorbs quickly. Of course it is great for after waxing, but its wonderful tally of ingredients also make it perfect for hydrating and conditioning the skin after sun or wind exposure. Sounds like it'll be an all-around great product for winter.